Two new pieces of artwork now grace Pensacola State College’s outdoor gallery. 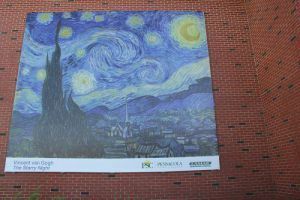 “The Starry Night” by Vincent van Gogh has been installed on the back side of the Ashmore Auditorium, Building 8, while “The Kiss” by Gustav Klimt is on the south end of Building 14, facing the Charles W. Lamar Studio Gallery. The two reproductions join the Dutch masterpiece, “Girl with a Pearl Earring,” on Building 14, and “Boy in Mid-Flight,” an image from renowned National Geographic photographer Steve McCurry on Building 4. “Girl with a Pearl Earring” and “Boy in Mid-Flight” were installed in 2014. And most of the art – with the exception of “The Kiss” is visible from 9th Avenue. Pensacola State Visual Arts Department Head Krist Lien said the additional reproductions are the beginning of a more “art-friendly” college. “Dr. (Erin) Spicer and I talked about having more artwork installed across the Pensacola campus – maybe one per semester – and eventually moving on to add artwork reproductions to our other campuses and centers,” Lien explained. The college partnered with Lamar Advertising, who reproduced the artwork. The next piece of artwork is scheduled to go up in spring 2018 but what it will be and where it will be installed has not been determined. “We’ve considered allowing the faculty and staff who work in the next building to have input into what artwork they want on their building,” said Lien who added, the murals attract a lot attention on and off campus. “We have received a lot of feedback from Cokesbury United Methodist Church about Steve McCurry’s ‘Boy in Mid-Flight.’ It seems the children in the church’s day care wanted to know why the boy was running down the alley,” Lien said. “The kids have asked their teachers and parents about the reproduction. These are the responses we want our community to have about the world of art.